Gear Pump Systems | EGM, LLC. EGM Gear Pump systems are built to be compact, rugged, and reliable. 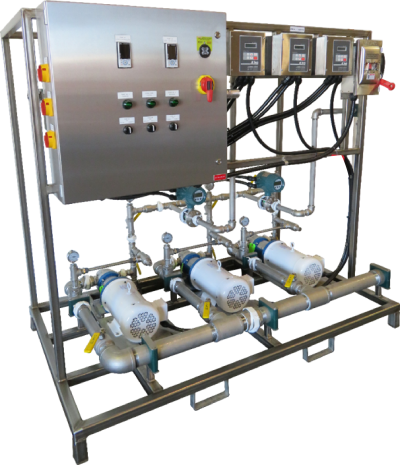 Systems are normally equipped with pumps manufactured by Roper, Ranger, or Liquiflo and designs can be modified to accommodate end-user specific brand choices. Simplex, duplex, and triplex configurations are available as standard designs and customized, multi-pump units can be built. Systems can be configured in a multitude of ways with accessories such as variable frequency drives, motor starters, dilution loops, process instrumentation, and connectivity to a supervisory PLC or DCS. 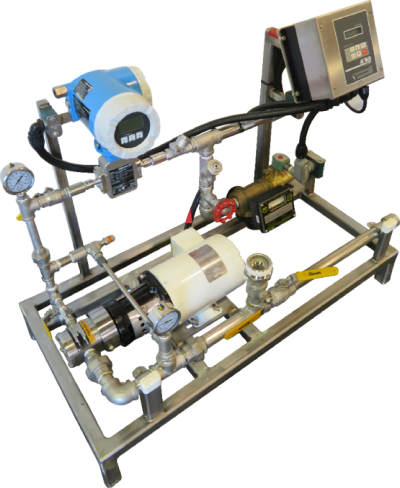 Multi-pump systems can be configured with an on-board spare, whereby all required plumbing, valving and electrical signal switching is in place to allow for simple redundancy for run-time critical applications. EGM systems are available in different power configurations to meet the site specific requirements. For applications that pump viscous chemicals, EGM incorporates additional features such as oversized suction piping to promote good flooded suction to the pump to prevent flow swings and equipment damage. EGM also has the appropriate experience to properly size and, if needed, include gear reduction to insure high viscosity systems perform to expectation.